The Rev. Peyton's Big Damn Band is an extremely fun and quality three-piece from Indianapolis. They aren't flashy, you'll probably never see them on MTV and since they're a three-piece, they aren't really even a "big damn band". They make a brand of blues that originates from the swamps of the Mississippi Delta, and seemingly like much of the music that comes out of the south, it's a family affair. The Rev. 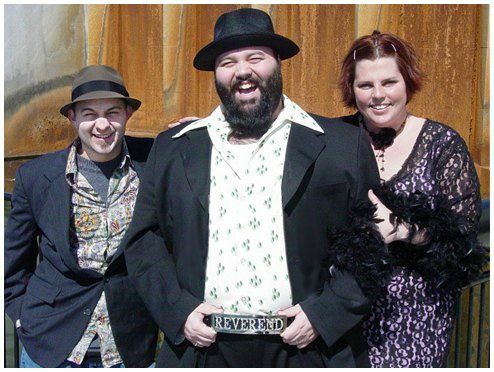 Peyton handles the vocals and guitar work, his brother Jayme beats the drums and the Rev's wife, "Washboard" Breezy, rips up and down her nickname's namesake. It's a rythmic frenzy and while the band may not actually be big, the sound they create is. These kids will be playing at this year's Midwest Music Summit, so if you're in the area, come stomp your feet and holler with the Rev. The Rev. Peyton's Big Damn Band's MySpace.